Some people like my husband love their coffee. Not me, I much prefer some tea. Be it a nice hot mug or a tall iced glass, tea is for me. Teami Tea blends are high quality, pure organic loose leaf, wellness teas. They have six varieties including; Colon, Alive, Profit, Skinny, Energy, Relax. Each tea is a blend of natural herbs, roots, flowers and spices combined to bring you not just a tasty drink but one filled with added benefits. 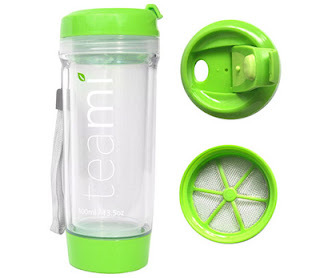 Whether you need a little pick me up in the morning, a nice soothing drink before bedtime or are looking for a boost to your health, Teami has what you are looking for. 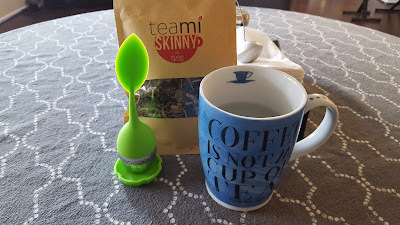 I was sent their Skinny tea for review along with a Teami Tea Infuser. Skinny tea is a combination of Oolong tea, Yerba Mate, lime leaf extract, lotus leaf, ginger root, dandelion leaf and rhubarb root. This tea does not have a laxative effect so you can drink as many cups a day as you like. It does however do a good job of suppressing your appetite. No, it's not going to magically make you lose weight but it may keep you from eating to much and snacking throughout the day. At least it does for me. I have been drinking a hot cup in the mornings and it keeps me from eating to large of a breakfast. I also have some iced in the middle of the day when I feel the urge to snack and it really helps curb that. I love the taste of this tea, I prefer mine without sweetener but a little honey or natural sweetener can be added if you like. I love the tea infuser! Not only is it really cute but so easy and functional to use. To make a cup of tea you just screw apart the bottom, add about a teaspoon of Teami looseleaf tea, screw back together and place the petal in your mug. It will float in your cup as it steeps to a perfect cup. Just rinse when done and you are ready for your next cup. Do you know someone that loves their cup of tea? 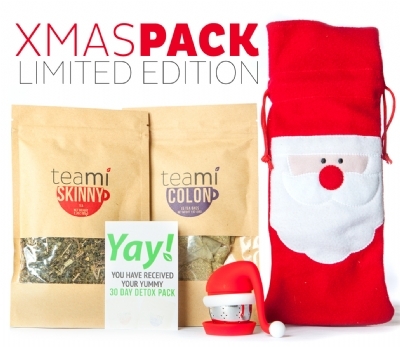 Teami currently has a Limited Edition Christmas Pack for sale. This Holiday Detox Pack includes a 30 day supply of both their Skinny and Colon teas, a Green Teami Tumbler, Teami Santa Infuser and Teami Tumbler Sock. A package valued at $94 for only $79.99 with FREE shipping.